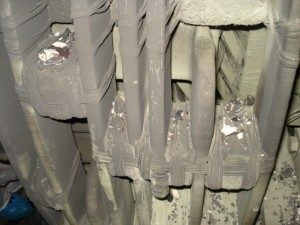 Over the past decade, there have been several reports of dusting on the GE® 7FH2 & 324 stator end-winding systems. The dusting has been found on earlier and late model generators. GE® 7FH2 and 324 type generators have a history of end-winding dusting as a result of materials used during manufacturing. A major contributor to this issue is the connection ring blocking. 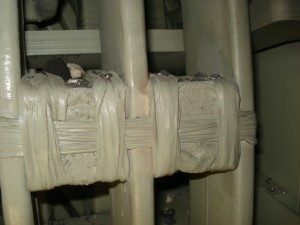 On some affected generators, the utilization of consolidated dry ties for the connection ring and connection ring to axial support blocking causes the Textolite™ blocking wrap felt and the connection ring mica insulation to lose their bond. 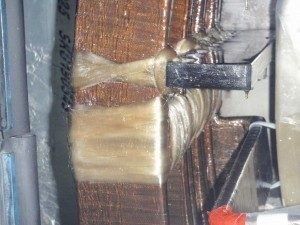 When this occurs the connection ring blocking material can abrade the mica insulation to the point where the copper is exposed. If not addressed the dusting can lead to serious damage to the generator up to, and including, a ground fault. MD&A has trained personnel who are qualified to inspect the stator end-winding and identify if the unit has consolidated dry ties being affected. 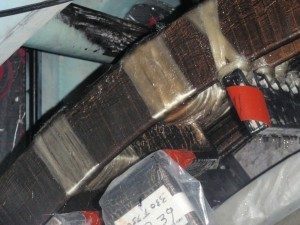 Our experts can solve this problem by replacing both the connection ring and connection ring to axial support blocking and ties with new blocking and wet ties. Have MD&A look at your stator today. Call our Turbine-Generator Repair Facility at (314) 880-3000 or use our Contact form.